Recently, I started training my parents online. I try to send them everything they need to be fitness nonconformity badasses, and so far it is working out great. 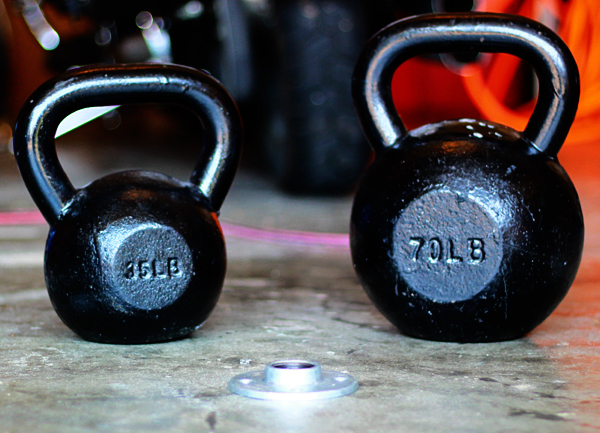 Last week, I designed a workout for them that involved kettlebell swings. I knew they did not own a kettlebell so I recommended using an old milk jug filled with sand or even a laundry detergent canister for the swings. They used the laundry detergent bottle, but they said it wasn’t great. I visited them this weekend to hang out, let them visit with their new grandson and to talk fitness a little bit. I brought a long with me, as I always do when I travel by car, two kettlebells and a speed rope (just in case). 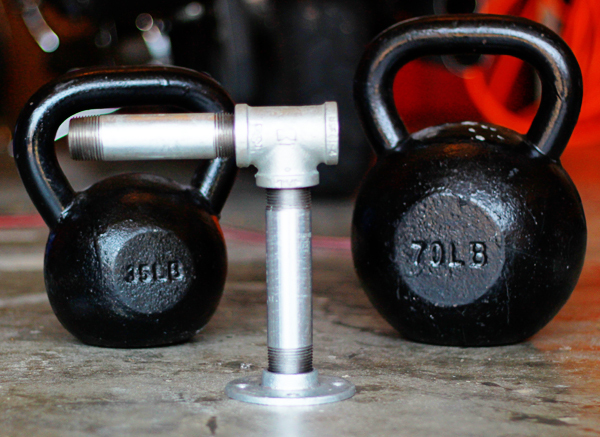 I let them play with the 1 pood kettlebell (35 lbs.) 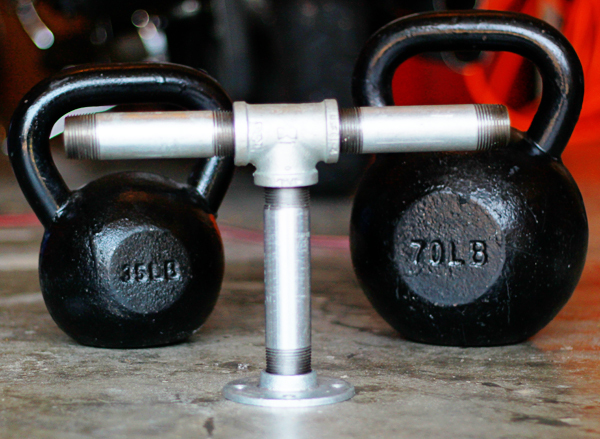 and they said it was a decent weight but not for high repetitions, since all of this functional fitness and kettlebell training was new to them – I was in complete agreement. The solution – DIY TIME!! 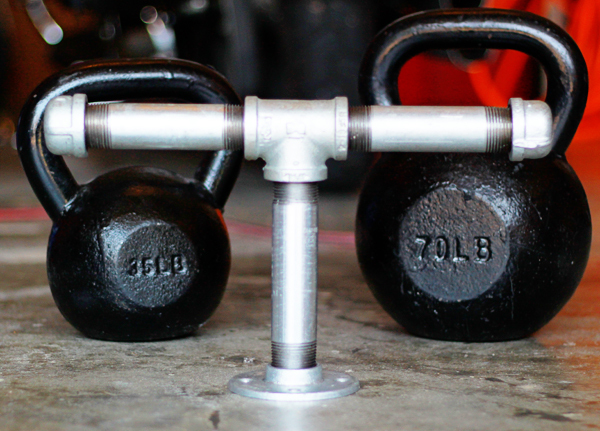 If you are interested in Pavel Tsatsouline’s, Enter The Kettlebell! Strength Secret of The Soviet Supermen, I suggest building the more elaborate homemade KB’s or even purchasing your own. 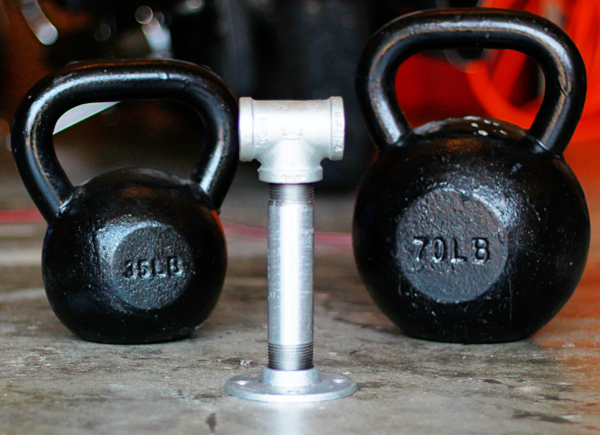 This version is quick, easy and a very cheap way to throw kettlebell swings into your training immediately. As long as you know what this version should be used for…we can now get started. Get ready to start your stopwatch! Also, don’t blink, you may miss it! 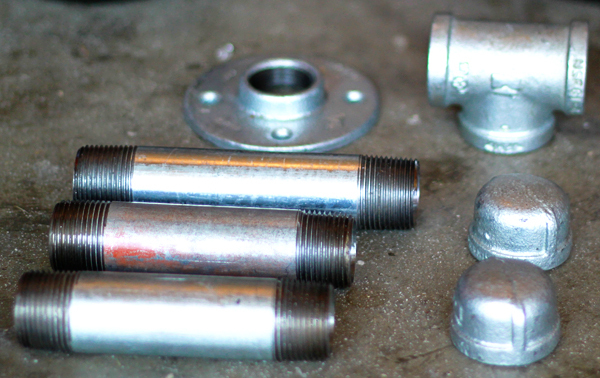 6″ piece screws into the flange. T-shape goes on top of the 6″ piece. 5″ piece goes in T-shape (1). 5″ piece goes in T-shape (2). End caps go on 5″ pieces. 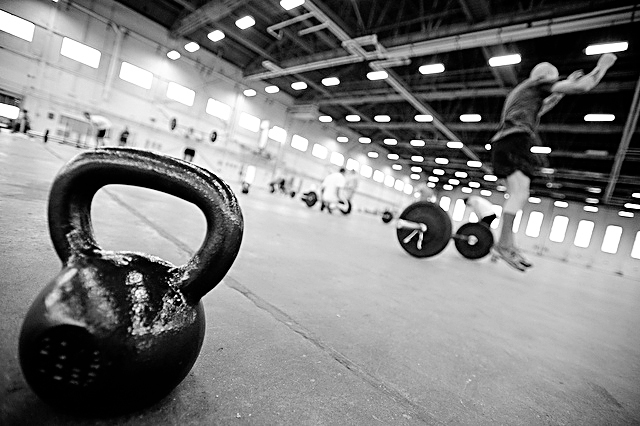 Kettlebell complete! Stop time! How long did it take you? 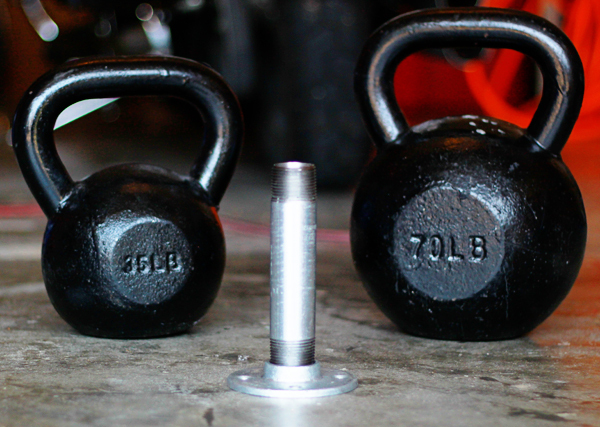 Step 3 – Remove bottom flange and add weight plates of your choice (5 lbs., 10 lbs). Step 5 – Get in shape knowing you are not part of the fitness ‘norm’. *If you feel this is too wide for your legs, or hands, you can buy smaller pieces for your handles. *If you need to add more plates but don’t want a larger plate size, just buy a longer vertical pipe and stack more. *Plates won’t be a snug fit. Use duct tape to widen diameter and dampen the noise. Broken down into the usual Eo3 Fitness categories. Like I said there are more elaborate versions you could create, but this is quick, easy and cheap. If you have any questions about this project add it to the comments!